Fronek Anchor/Darling Enterprises, Inc. | Piping Technology & Products, Inc.
About Fronek Anchor/Darling Enterprises, Inc.
As one of PT&P’s wholly owned subsidiaries, Fronek Anchor/Darling Enterprises, Inc. is a leading supplier of hydraulic, mechanical, and rigid restraints, including the dynA/Damp snubber. 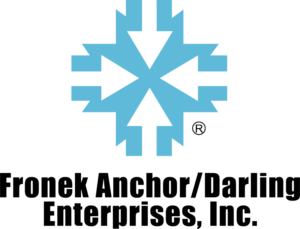 PT&P acquired Anchor/Darling Enterprises, Inc. from the Shaw Group in August 2004. Proven hydraulic snubber built in accordance with the requirements of the ASME Boiler and Pressure Vessel Code. Its manifold configuration eliminates external tubing and its pressurized reservoir allows installation in any spatial orientation. DynA/Damp non-locking mechanical snubber with a simple, rugged design and corrosion resistant construction for superior performance within many environments, also built in accordance with ASME Code requirements. Designed to protect critical power plant components during dynamic loadings caused by seismic disturbances, slamming of check valves, unstable pump characteristics, discharge of safety relief valves, water hammer, or other transient forces. Unlike other mechanical snubbers, the dynNDamp snubber is ruggedly designed and employs no complex clutches or spring mechanisms. It never needs lubrication or adjustment, and can easily be tested in place. Gradual movements, such as those caused by changes in temperature, are virtually unrestricted. Locking mechanical snubber for use as whip restraints for large pipes and vessels, and relief valve reaction forces. This type of restraint is available in load capacities ranging between 10 and 125 kips with stroke and end connections to fit customer specified applications.